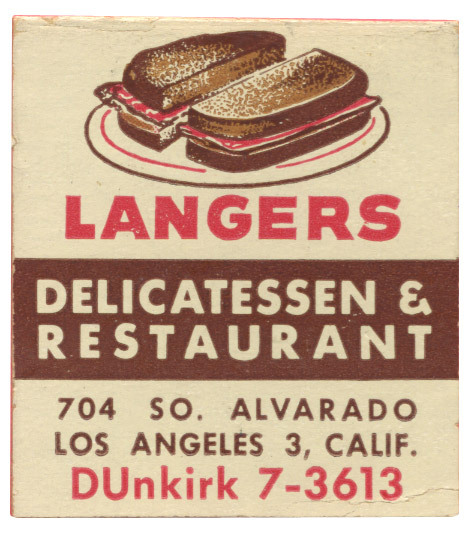 From its humble roots to its current success, Langer’s Delicatessen-Restaurant of Los Angeles, California, is the quintessential story of classic American enterprise. The story begins in 1905, with the arrival at Ellis Island of Harry and Rose Langer, from Odessa, Russia. A tailor by trade, Harry settles with Rose in Newark, New Jersey. They have three children, all boys: Joe, Al and Morris. Harry is an observant Jew who must work on the Sabbath (Saturday) in order to support his family. As soon as the boys are old enough, they begin working in local businesses. In 1924, Al, age 11, gets a job at a local delicatessen as a busboy, cleaning tables and assisting the waitresses until they went home at 8PM. Thereafter, Al would wait tables on his own until closing. It was during this time that young Al became a favorite of the patrons, including local underworld figures who would feed their crews pastrami while awaiting bootleg alcohol shipments from Canada. As a precocious kid, Al would play the “tough guy” to the mobsters, earning $10 tips, an unheard-of amount for this period. Al brought all the money home to his mother, who used the earnings to support the family. As he grew into adulthood, Al continued to work in delicatessens throughout the New York area, including Manhattan, New Jersey, the Catskill Mountain resorts, and even a stint in Miami. It was during this time he perfected his ability to hand-slice pastrami, a “lost art” knifing skill that preserves the juicy flavor and tenderness of the meat during cutting. As a result, Al became a highly sought-after delicatessen counter man. In 1936, Harry, Rose, Joe and Al Langer relocated to Los Angeles, where new opportunities in tailoring work awaited the head of the family. Al began working at a variety of delicatessens around Boyle Heights in East Los Angeles, then a thriving Jewish community, as well as locations on Hollywood Boulevard. Al’s first experience with entrepreneurship was in the fall of 1936, when he opened a deli in the then-predominantly Jewish resort community of Palm Springs. As a seasonal resort, businesses were only open during the six winter months when crowds would flock to the desert for warmth and relaxation. And because everything had to be trucked from Los Angeles, keeping ingredients fresh for his patrons posed a challenge for Al. In particular, rye bread quickly turned stale during transport, so Al devised a solution: throw the loaf into the oven and re-bake it, giving the bread a warm, super-crispy crust that instantly became a favorite of his patrons. This “re-baking” technique is used to this very day at Langer’s Delicatessen-Restaurant on every loaf of rye bread they serve. The Palm Springs deli only lasted one season, and Al returned to Los Angeles, where he worked at a Hollywood delicatessen adjacent to the Paramount Theater as the lead counter man. He would cut the meat, supervise 30 food-prep employees and take orders from all the walk-ups. It was during this time that Al began to take an interest in Jean, the pretty Hungarian Jewish waitress working tables at the deli. But he soon learned she was married. In a twist of fate, her husband passed away and after waiting the requisite year of mourning, Al asked her out on a date. They were married three weeks later. Soon World War II called and Al found himself in the United States Army, stationed at Fort Rucker, Alabama. Jean followed him and after the war’s end, they returned to Los Angeles, where Al again felt the pull of entrepreneurship. He and Jean had a one-year ownership of a small deli at 8th and Irolo. Al then purchased The Famous Deli, a small delicatessen near the corner of 7th and Alvarado, a mere 12 seats for patrons. This diminutive location would become the Langer’s Delicatessen-Restaurant we know today. Time passed and as Al’s successes grew along with the deli’s. Space became available south of the original location, allowing the restaurant to expand first to 58 seats and by 1968, to 135 seats (the present configuration). Located diagonally across the intersection from MacArthur Park, Langer’s Deli flourished. The vibrant neighborhood, the destination nature of the park (with its large lagoon and day-boating adventures for Angelenos), and a reputation for delicious food and good service all contributed to the ongoing growth of Langer’s. Jean, Norm and Al Langer on the set of the 1955 Warner Bros. release ‘Miracle in the Rain’ with star Jane Wyman. Langer’s still provides catering to film and television productions throughout the Southland each week. It was during this halcyon period of the 1950s and early 1960s that Langer’s Delicatessen-Restaurant became famous for its delicious pastrami and hot, crispy-crusted rye bread. Al created the #19 — hot pastrami, cole slaw, a slice of Swiss cheese and Russian dressing on hot rye — and it quickly became the deli’s most popular sandwich, a laurel which it holds to this very day. One of the classic characteristics of any delicatessen, particularly those of the Jewish variety, is an enormous menu with literally hundreds of choices and combinations. 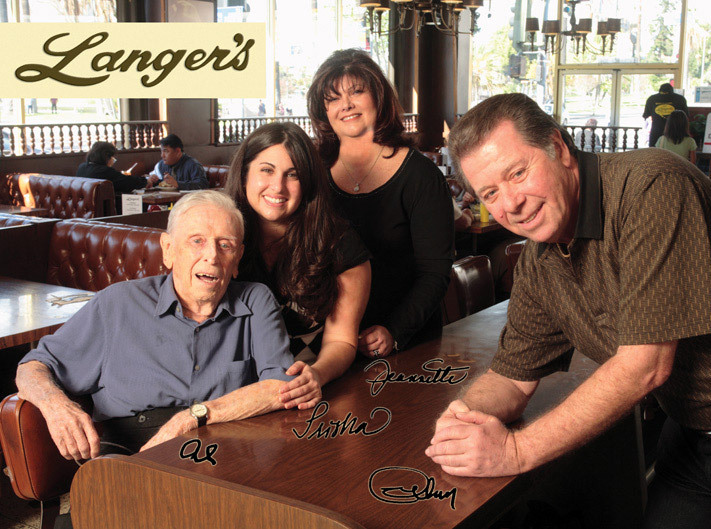 Langer’s is no different; Al worked with Jean to develop the menu so that just about any taste would be accommodated. 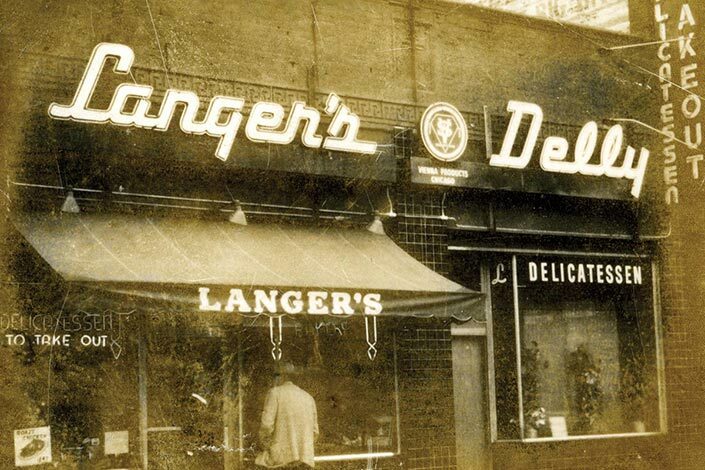 Throughout the 1950s and into the 1960s, Langer’s competed with other famous delis throughout the greater Los Angeles area, including Cantor’s, Junior’s, and Nate and Al’s. It stayed open 6:30AM-1AM Sunday-Thursday, 6:30AM-3AM Friday-Saturday, welcoming customers from all walks of life, literally at all hours of the day (or night). Al served famous entertainers from Hollywood, who would make a special trip down Alvarado from Hollywood to get a #19 featuring the best pastrami in town. But with the passage of time, encroaching demographics began to take a toll on Langer’s bottom line; by the late 1960s, most of the Jewish residents had long since moved to the mid-Wilshire, Westside or Valley, and the neighborhood became less desirable as major retailers like Bullocks Wilshire closed their doors. Worse, MacArthur Park began earning a reputation as a drug haven. The restaurant cut back on hours and saw harder times than in any other period of the deli’s history. Al’s son Norm began to take a more active management role during this period (the early 1970s) and worked closely with the Los Angeles Police Department to help improve quality of life in the neighborhood. 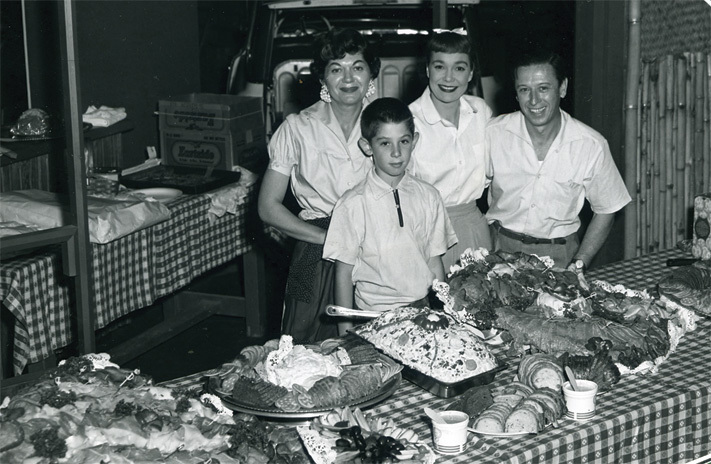 More than just deli owners, the Langer family became recognized by civic leaders as instrumental in helping clean up the MacArthur Park district of Los Angeles, working closely with LAPD Community Policing efforts to bring more of a personal presence of law enforcement to the neighborhood. The impact of these actions resulted in a safer and more hospitable environment in which to operate their business, and ultimately more inviting for customers. The citations presented to the Langer family hang on the walls of the delicatessen for all to appreciate. The modern era of Langer’s success dawned with the completion of the Metro Red Line subway and the opening of the Alvarado Station one block from the deli, in 1994. For the first two years of operation, Metro allowed passengers to ride the line for free or heavily discounted fares. Hungry workers in downtown skyscrapers began to take a short ride on the subway to Langer’s for lunch, driving new business to the venerable deli. The revitalized neighborhood also presented a more welcoming face to patrons from Hollywood, mid-Wilshire and the Westside. The Langer Family in 2007: Al, Trisha, Jeannette and Norm. Today, Langer’s Delicatessen-Restaurant operates six days a week (Monday through Saturday), 8am to 4pm. Because the business has become primarily a lunch trade, it’s not uncommon to see a huge burst of patronage between 11AM and 2PM on any given day. The restaurant has become the stuff of culinary legend, earning accolades from quarters as diverse as the James Beard Foundation and Hollywood director Nora Ephron, who penned a loving tribute to Langer’s pastrami that stands as one of the best encapsulations of the Langer’s experience. Langer’s Delicatessen-Restaurant has been featured on countless television and newspaper accounts, served as a location in dozens of film productions, and is revered worldwide for its delicious pastrami, which is widely acknowledged by taste experts to be not only the best in Los Angeles, but surpassing that of legendary New York delicatessens, as well. Norm owns and manages the restaurant with his wife, Jeannette, and their daughter, Trisha. Al passed away shortly after the 60th anniversary celebration in 2007. Hot pastrami on crispy-crust hot rye continues to be the favorite order at Langer’s, and there’s no reason to think this won’t be the case 60 years from now, as well. From its humble beginnings as a 12-seat deli to the thriving operation it is today, Langer’s Delicatessen-Restaurant is a true American success story you can taste.